Subscribing to a List (‘autoresponder’). When a contact subscribes to your list or becomes a customer, why not set up a sequence of initial training / educational emails to go out automatically over several weeks or months, triggered on the customer subscribing to your list. Autoresponder campaigns (or ‘drip marketing campaigns‘) are not limited to a single email. Create a sequence of messages to be sent automatically, once a person joins one or more of your contact lists. Configure ‘set and forget’ campaigns for managing product trial downloads, cross-sell and up-sell campaigns, and complex nurturing programs. Best of all, you get to enjoy the benefits of improved responses while Pinpointe does the work for you. 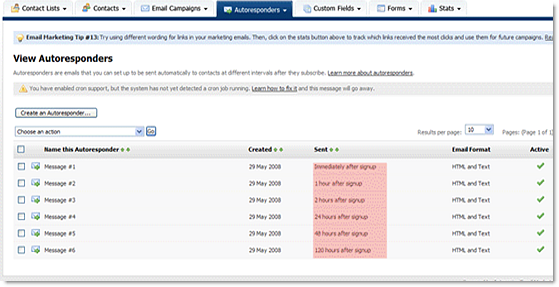 Configure email autoresponders with personalization as each trigger campaign can be personalized. For example, set up a series of emails where the first email comes from the marketing department. A week later, send a custom email from the regional sales representative. You can apply Pinpointe’s email list segmentation rules too. Use information you collect and send the triggered campaigns only to specific contacts based on location / geography, product interest, or any information in your Pinpointe contact profile. Set up a sequence of one or more drip marketing campaigns that are sent after a contact joins a list. Select how many hours/days/weeks to wait, after a contact joins a list, before sending each autoresponder. Optionally use Pinpointe segments to send each autoresponder to a subset of your list(s). Optionally set or change the send-from and/or reply-to email address. For more sophisticated drip email marketing campaigns configuration, followup and selection criteria, try Pinpointe’s event triggered email campaigns.